Apple today refreshed the MacBook, switching to Intel's sixth-generation "Skylake" processor architecture for slightly longer battery life. The new MacBook (vendor price) is priced starting at $1,299, the same as the initial model introduced more than a year ago. With a new graphics chipset -- Intel's HD Graphics 515 -- the MacBook boasts a 25% improvement in graphics performance, Apple claimed. The 1.1-GHz Skylake processor's lower-power demands should add an hour to the time between charge: Up to 10 hours of browsing, up to 11 hours of video playback. Apple also increased the speed of the flash memory that composed the 256GB SSD (solid-state drive) storage, from 1600MHz to 1886MHz. The MacBook is the first Apple notebook to get a processor from Intel's 14-nanometer Skylake line, the successor to 2014's "Broadwell." Other laptops, including Microsoft's Surface Book -- which debuted last year -- preceded Apple's to market. The MacBook form factor remains the same, with the system tipping the scale at 2 lbs. and taking the tape at a half-inch thick. 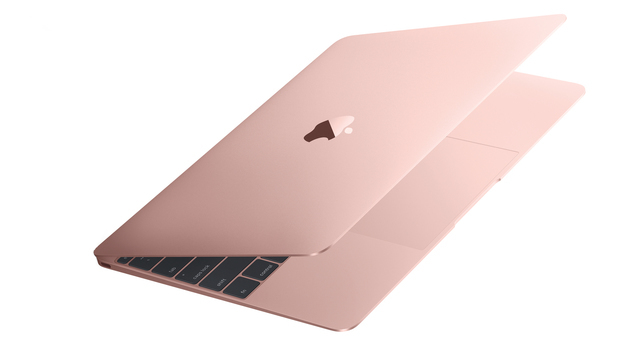 Apple added rose gold -- aka pink -- to the previous color choices of gold, silver and space gray to match the available options for the iPhone and iPad. Most other features stay static as well, including the single USB-C port -- the most controversial of Apple's design choices for the MacBook -- and the high-resolution 12-in. display that maxes out at a 2304-by-1440-pixel resolution. Both iterations of the MacBook -- the more expensive option remains the $1,599 model with a 1.2-GHz CPU and 512GB of storage -- are equipped with 8GB of RAM. Apple also said it has increased the standard RAM of the MacBook Air notebooks to 8GB. Now nearly ignored by Apple, the 2.4-lb. Air has not been refreshed since March 2015, and has not changed its design since 2006. It remains the only part of Apple's Mac line that lacks a "Retina" high-resolution display, whether standard or as an option. The new MacBook went on sale Tuesday on Apple's online store -- early in the day, however, the purchase page was inaccessible -- and was to hit its retail chain and some authorized resellers on Wednesday.